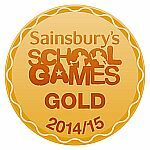 I am delighted to announce that we have been awarded the Sainsbury’s School Games GOLD Award 2014-15. This is a commendable achievement and testament to the outstanding PE opportunities and learning at St John’s. Sheralyn Silvester heads the PE team with unfailing energy and commitment. She promotes sporting excellence, participation for all and upholds and develops the values of good sportsmanship at every opportunity. She is wonderfully supported by the whole St John’s team, staff volunteers and parents who all value sport and support our children in taking part. Siaron Moore, Josh Still and Danielle Parfett all bring particular sports skills to this team.